ESL Flashcard Games for Kids: Ready, Aim, Fire! 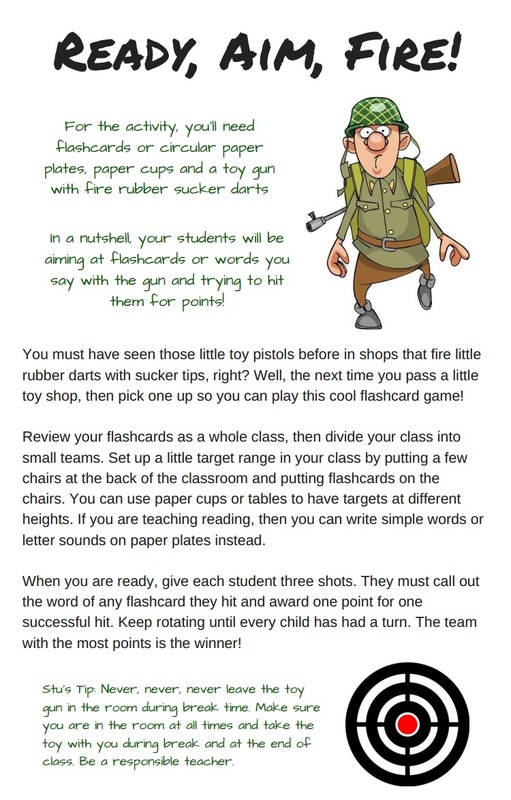 For this ESL flashcard activity for kids, you'll need flashcards or circular paper plates, paper cups and a toy gun with fire rubber sucker darts. In a nutshell, your ESL students will be aiming at flashcards or words you say with the gun and trying to hit them for points for their team! You must have seen those little toy pistols before in shops that fire little rubber darts with sucker tips, right? Well, the next time you pass a little toy shop, then pick one up so you can play this cool flashcard game! Review your ESL flashcards as a whole class, then divide your class into small teams. Set up a little target range in your class by putting a few chairs at the back of the classroom and putting flashcards on the chairs. You can use paper cups or tables to have targets at different heights. If you are teaching reading to the kids, then you can write simple words or letter sounds on paper plates instead. When you are ready, give each student three shots. They must call out the word of any flashcard they hit and award one point for one successful hit and if they said the right word first. Keep rotating until every child has had a turn. The team with the most points is the winner! Stu's Tip: Never, never, never leave the toy gun in the room during break time. Make sure you are in the room at all times and take the toy with you during break and at the end of class. Be a responsible teacher. Similar to Chinese whispers, this particular ESL flashcard game for kids sees two lines of kids passing down from the end of the line 3-4 flashcard words from the TEFL teacher down to the front. The child at the front must then arrange the ESL flashcards into the same order as the teacher said to make a copy! Don’t Sit on the Booby Chair! An amazing simple and fun ESL flashcard game for kids, where students have to race to sit on any chair EXCEPT the chair where the correct flashcard is on! To do this, put five or six chairs in a row with a different flashcard on each chair. The TEFL teacher calls out a flashcard and the kids must race to sit on any chair EXCEPT the one with the named flashcard on.